The event at Alter Ego Comics will have characters in superhero dress. LIMA — Marc Bowker, owner of Alter Ego Comics likens Free Comic Book Day to a festival for comic book aficionados. This will be the 13th year for Free Comic Book Day, and the third year for Alter Ego Comics taking on Touch A Truck. “We have just over 20 different titles that people can choose from. Each guest can choose up to five different titles. If people make a donation of any amount to the Children’s Developmental Center, they can choose up to three more free comics. So they can get a total of eight with a donation,” said Bowker. 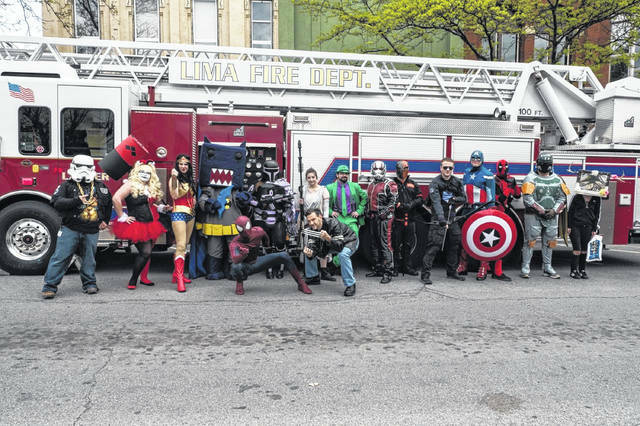 Other downtown Lima businesses are getting involved in Free Comic Book day as well. Beauty By Jill will have temporary tattoos, The Meeting Place on Market will have superhero-themed specials and Nitza’s and Pointe of Joy will be giving away free comic books, while supplies last. Barry Electronics on Allentown Road will be giving away free James Bond comic books to the first 100 visitors. Sara’s Sweets on Eastown Road is having a Superhero Day from 9 a.m. to 5 p.m., with 10 percent of sales going to the West Central Ohio Autism Community. Come dressed as your favorite superhero and receive a free item. A sensory-friendly hour will be held for families affected by autism from 4 to 5 p.m.
Bowker urges people to come dressed as their favorite comic book character. Touch a Truck will begin from noon to 2 p.m. Saturday and features a fire truck, garbage truck, Hummer, ambulance, park ranger vehicle, a wrecker, the Lima Public Library mobile library and more.